Hello ♥ It's finally end of the year, and there are so many Christmas parties and events happening! 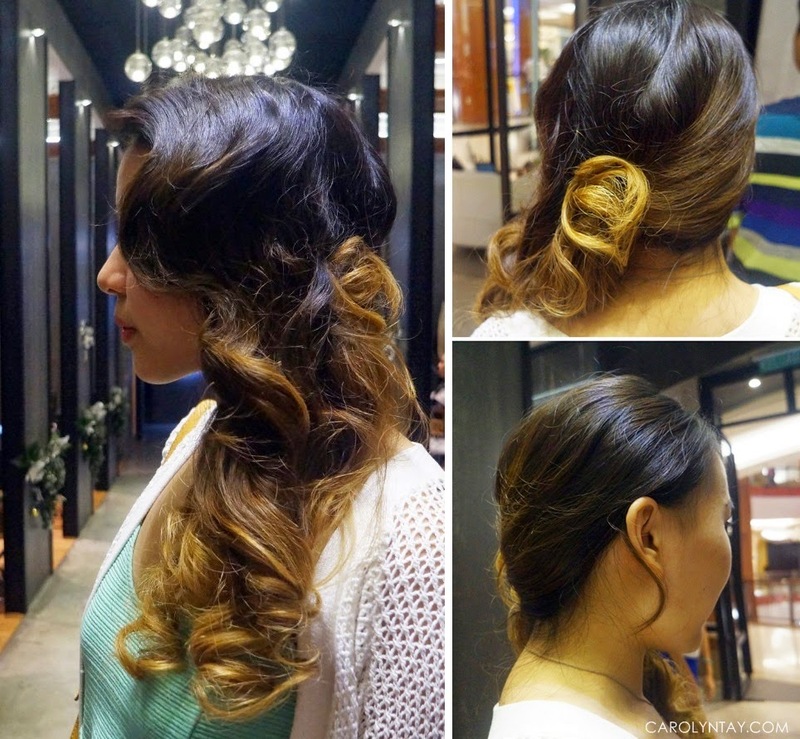 Hairco at The Gardens Mall are having this Wash, Blow and Style promotion for only RM98(Any length! 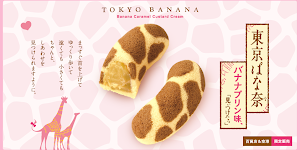 ), so I was tempted to give them a shot. Hairco Salon has many years of experience in this field and are patronized by many big celebrities and VVIPs. They only uses Shiseido Professional products for all their hair services. 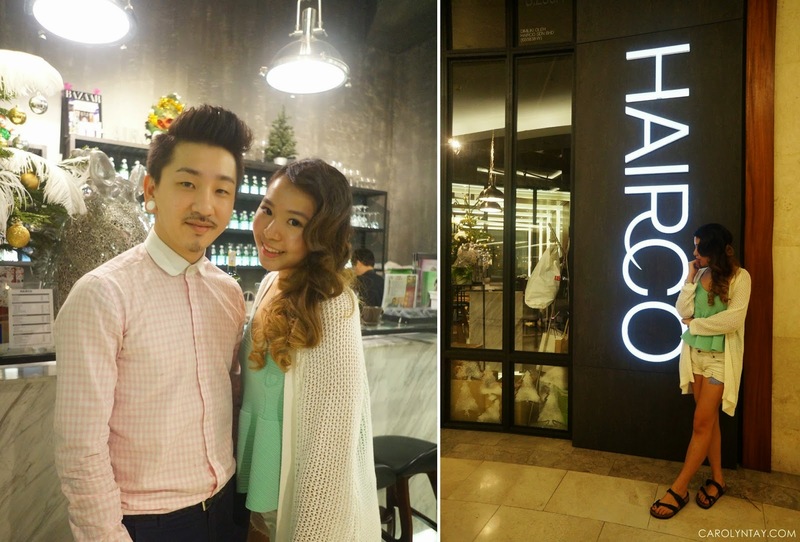 If you are wondering, Hairco is situated between Isetan and Ying Ker Lou on the 2nd floor of The Gardens Mall. You won't missed the sign, it's ginormous on the outside. Hairco actually serves free drinks to their customer, no matter what services you chose to do, you are entitled to bottomless Tea, Juices, Sparkling water/juices, White/Red wine, Coffee and so on. I am really impressed at their generosity and impeccable service. There is a cool waiting area for your other part to relax while waiting for you. Of course, they are allowed to enjoy the free drinks as well! My hair stylist was Nick and he did ask me a few questions on my preference before he start styling my hair. I told him about my previous chemical services history and he explained that my hair was damage and dry so he will use a different type of products for me. They do not charge extra for that as well! Eric was the assistant hair stylist and he washed my hair for me. He is really attentive and his head massage is amazing! I hope it could go on forever because I could seriously fall asleep on the washing area. Nick and Eric both blow dry my hair after applying the Shiseido Professional Caviar Essence on my roots to nourish them. Nick also showed me the Instyler Rotating Hot Iron that he will be using on my hair, it was my first time trying it out after hearing all the hype in YouTube. I am really thankful that Nick and Eric was really patient with my hair, they took more than an hour fixing this hairdo for me. I have quite a lot of hair and the curling itself took more than half an hour. I do pity them for styling my hair, this is so much work! The director, Raymond told me that the finger wave is one of the toughest hairdo as it requires a lot of effort and skills. Did he did a great job? I think he certainly did. I will give him 100 marks on his passion and effort given. He really did every part in detail to make sure everything is perfect. He go through checks a few times before he let me go. Finger wave fringe, side ponytail with a rose. 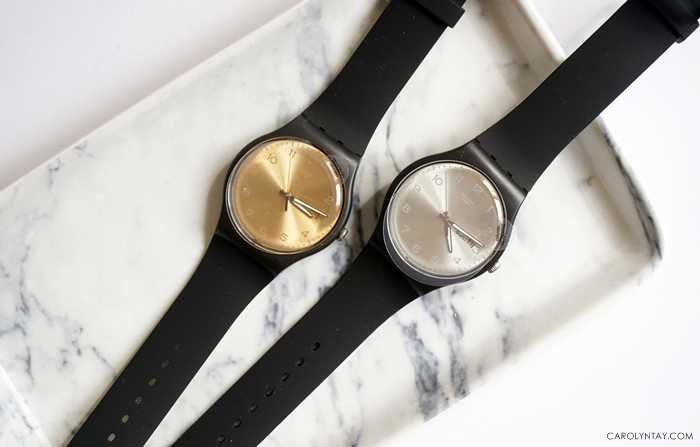 It's so retro with a modern twist! That's Nick, do look for him and Eric when you're there! I've gotten the chance to sit and talk to the director, Raymond about this salon and he said that he believes in providing the best service to their customers. Sitting and waiting in the salon for your hair to be done can be quite a long and boring, and this is why Raymond provides all this extra services so that customer can enjoy and relax while beautifying themselves. Overall, I think it is worth paying RM98 for this service and I would return again if I have a chance. I really love their warm hospitality! Maybe I can bump into a celebrity the next time? Heh. My hair was still intact at the end of the day and smelling really good! I love how the hairdo accentuate the 3 different colours of my hair. 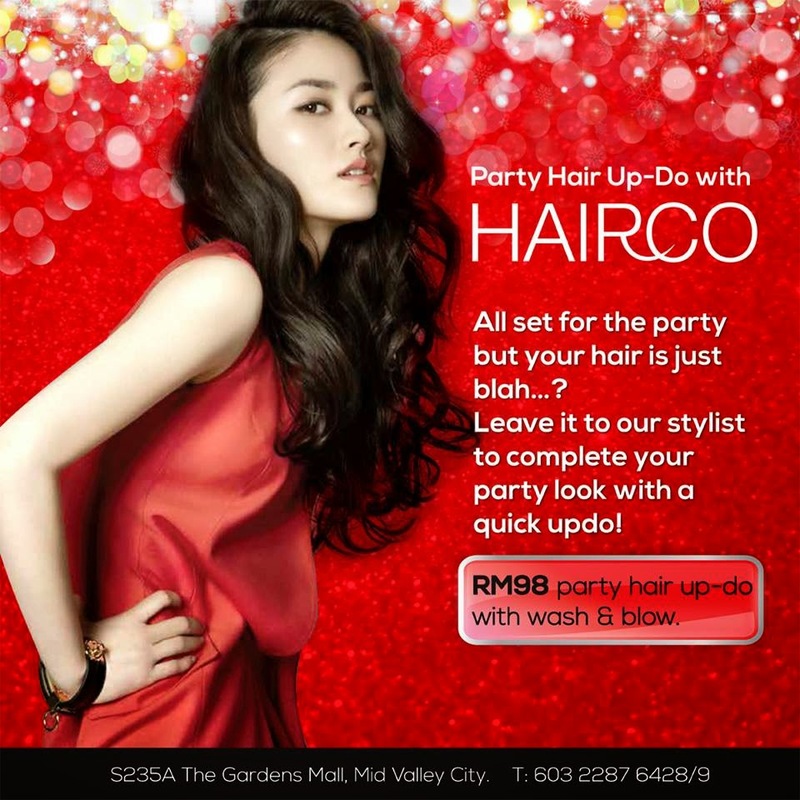 As a reminder, Hairco is doing a promotion whereby you can have a special party up-do with wash & blow for only RM98, for any hair length! You can sit back and enjoy the free services while the stylist do the job for you. Do remember to call and book before you go!